The image shows an animation of the Airy beam working as a snowblower conveying particles from one compartment to another. 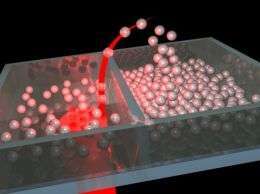 (PhysOrg.com) -- Researchers at the University of St Andrews have made a surprise discovery using light beams that can travel around corners. The academics have developed the concept of moving particles within light beams that follow curves rather than go along straight lines building on their work in the area of optical manipulation. Professor Kishan Dholakia of the School of Physics and Astronomy commented, "Physics holds many surprises; our understanding of how light moves and behaves is challenged by such beams and it is exciting to see them move into the interdisciplinary arena - light has thrown us a curve ball. "A standard beam of light spreads as it travels due to the wave effect known as diffraction. Take a laser pointer - even that would be 100km wide if this light beam were to reach the moon. "Our research has shown that certain light beams do not diffract or spread - they can travel around corners and propel particles round corners. This is a new discovery in the phenomenon of light moving particles." Thirty years ago scientists found that the Airy beam, named after the famous British astronomer Sir George Airy, had a mathematical parallel in optics. Recently, it was discovered that the beam actually 'bends' or curves as the beam moves through space unlike a laser pointer, for example. The St Andrews team have now taken things much further by utilising this unusual curving property of Airy beams to send particles literally around curves and corners, sweeping aside or 'clearing' particles within a sample chamber. Team member Joerg Baumgartl said, "The Airy beam allows us to clear a sample chamber without any moving light fields: in essence it acts like a small snow-blower for microscopic glass particles and even cells. It could have major applications in microfluidic engineering and cell biology." The findings of Joerg Baumgartl, Michael Mazilu and Kishan Dholakia in the School of Physics and Astronomy are published in the latest edition of the journal Nature Photonics. The team are now exploring a number of new avenues with these light fields including intriguing new particle sorting as well as possible methods for separating chosen cells from a given population. "This beam shows a wonderful example of how an elegant but perhaps obscure mathematical discovery in quantum mechanics has powerful analogies to laser beams and in turn leads to important new applications for science," said Michael Mazilu. But the important question they dont answer, how long before i get my light saber? More importantly, how long till I can get a laser gun that can shoot around corners? Or... a laser microphone that doesn't require line of sight? Or a Narrow bean radio like microwave, radar or lidar that doesn't require line of sight. Whole new level in stealth vehicles. Casting shadows from impossible directions. "Sir, we have the enemy F22 on our radar, he's coming at us from under ground." You guys are americans, right? Nothing else than weapons matters to you? ok this is definitely weird. or so it seemed until I looked it up. I remember reading about this type of light a while back. The light doesn't actually travel around corners at all that is an over simplification of what is going on. No i am dutch.Dikes matter a lot here. jeff, could you post up the links to the material explaining Airy beams?, I can't find anything very clear on the web, thanks. Why is it that the example pics in this article and the ones linked here http://focus.aps....v20/st19 are all animations or computer simulations? Is this just theory or is it real? I think you are selling Americans short. Other things that matter to us are sausage, cold beer, fast cars, loose women, and lets not forget guns, oh wait that is what started the whole thing. So tell us what nationality you are so we can comment on what must matter to you. This is a poorly written article (as usual), but google has plenty of info (also as usual). The light still travels as usual but complex interference between various parts of the beam (which has a specially prepared shape) leads to a bent trajectory of the beam as a whole. Or you could use the bendable property to loop the tube of ionized gas back into the transmission device and have yourself... you guessed it... Light Sabre. W00t.